Best Bottom-Best Bottom Solid Color Reusable One Size Cotton Diaper - — Cute Little Me! 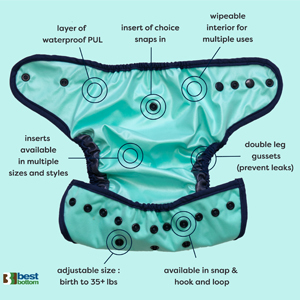 Created the of all the different cloth diapering systems and eliminate the cons. The Best Bottom cloth diaper system is trim fitting, highly absorbent and not overwhelming. 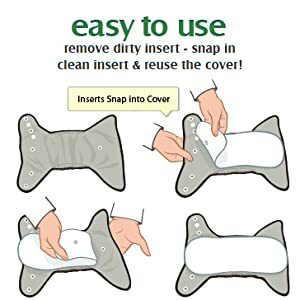 Just adjust the snaps on the shell to fit your baby, snap an insert into the diaper, put the diaper on your baby and go! Best Bottoms are easy to use and easy to clean. Simply lay the shell flat and snap in insert into place. When it’s time for a change just unsnap the insert and wipe the shell clean. Three sizes of inserts are available in Stay Dry and Organic Cotton/Hemp. Put on baby and go! Why Choose Best Bottom Diapers? We have been in for over 15 years, Best Bottom Diapers brand has been used by loyal customers for over 8 years. To reduce our environmental impact, all products have been thoroughly researched and are all PVC-free and USA CPSIA compliant. All the products we have developed are reusable and have been designed to replace disposable items; helping to reduce waste that ends up in the landfills. The Best Bottom diapering system to fit from birth the potty training. Quality - Made In The USA! The highest quality of materials available have been selected with as much of the raw made in the USA as we could find. The entire Shell is made with USA-made materials! ALL of our products are proudly handcrafted in the USA at local to support the local economy and reduce our environmental impact. We use durable snaps and & loop, double layer of waterproof PUL creating a perfect no-leak sturdy shell with a wipe-able inside lasting for many washes. Warm or hot (not sanitary) full wash with additive-free detergent (use detergent's recommended amount). Use the most amount of water possible. *Tip! Throw a soaking wet towel your washing machine to "trick" it into using more water. Inserts can be tumble dried. Shells should be line dried for best results or tumble on no heat.